Anne Stubbs lived in Skelton parish during some of her adult life. It is difficult to determine where Anne was born as her age is not specified on any documentation . An assumption can be made that she was born around 1760. The first evidence we find about Anne’s life is 5 May1782 when her son John was christened in Skelton parish. The records list his birth as illegitimate. John did not survive beyond infancy, dying aged 11 months on 2 April 1783 in the village of Unthank within Skelton parish. There is no evidence to be found of Anne Stubbs being given financial assistance with this child. Anne had a further illegitimate child, a daughter, Mary, christened in the parish, on 30 November 1788. She did get financial help with Mary. 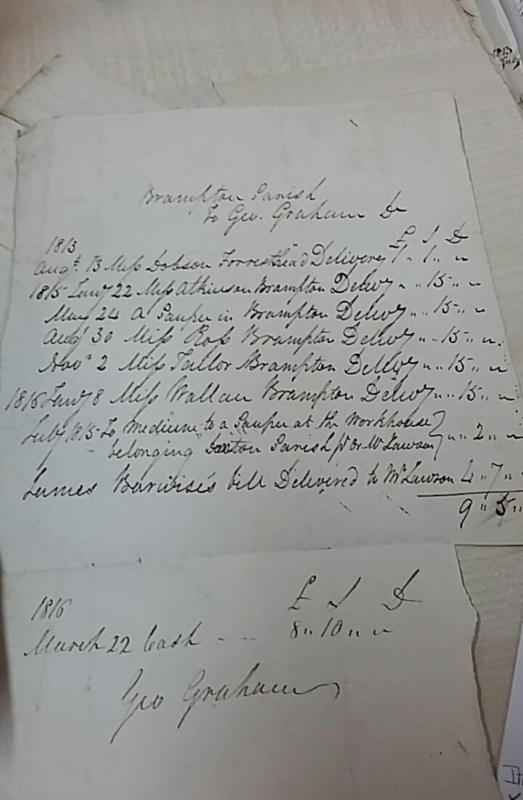 The Overseer of the poor and Churchwarden account book shows Ann’s name on a list of poor chargeable to the parish in the year 1789. 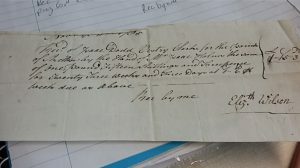 The examination of Ann Dodd under oath determined where her right of settlement was. 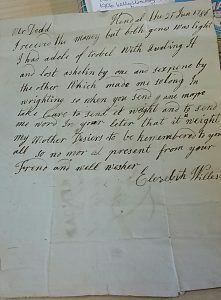 The account is hand written and difficult to read in parts (image below) Anne appears to tell them that she had been living at Wardle Hall, Unthank, for one year. John Wilson being a yeoman there. She believed her legal settlement to be in the parish of Skelton. Any other views as to what she thinks of her present situation or an explanation as to her presence in Carlisle are not recorded. 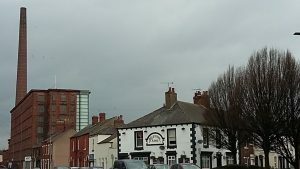 Was Anne’s daughter alive and left at Skelton? Was she looking for work or visiting relatives?. She may just have been trying to get back to Skelton. Her apprehension may have afforded her free assistance home. The rest of her life is a conundrum. 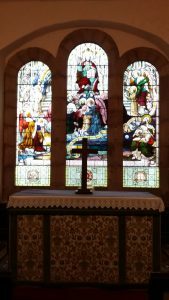 A baptism in Skelton parish of a Mary Ann Stubbs in March 1814 may be her daughter Mary’s child but this is just conjecture. Joseph Potts Esq was Mayor of Carlisle three times as well as Justice of the Peace. He died in February 1793. This is a work-in-progress, subject to change as new research is conducted. The Reverend Tovey Jolliffe had various posts in Hampshire before becoming Rector of Skelton on 11 June 1791. 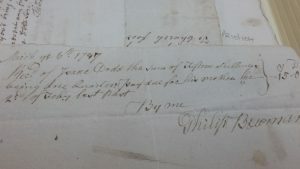 The living of Skelton was in the patronage of Corpus Christi College, Oxford, from where he had obtained his qualifications (B.A 1768, M.A 1772 and B.D 1781). From 1795–98 he was also Rector of Brooke, Hampshire. Jolliffe was born on 16 January 1750 at Newport, Isle of Wight, to James Jolliffe (1717– 95) and his second wife Frances Smith (1716–87). 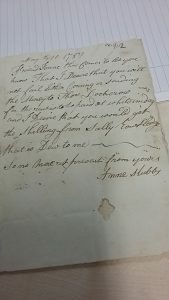 Shortly after coming to Skelton Tovey married Grace Dobinson (1751–1832) in Carlisle on 27 May 1793. Two of Grace’s sisters, Catherine and Mary, had also married clergy, whilst a third sister, Elizabeth, remained unmarried. 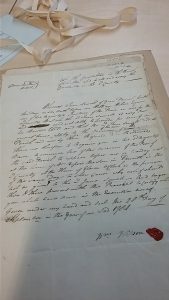 M. Yates’ letter in the Memorials of a Family in England and Virginia 1771–1851 recounts: ‘It is talked that Miss Grace Dobinson is to marry a Parson whose name is Jolliffe. He has a living near Greystoke’. Tovey and Grace Jolliffe set up home in Skelton. In the eighteenth and nineteenth centuries local affairs were run by parish vestries with the local squire and parson often in charge. There are several accounts of Jolliffe’s involvement in the parish affairs. Newspaper items respond favourably on his provision of coal and beef to the poor at Christmas. On Friday week, the Rev. Tovey JOLLIFFE, of Skelton, with his usual liberality, distributed a quantity of excellent Beef to the poor inhabitants of that village. It is the constant practice of this benevolent gentleman to give large quantities of Soup to the same people every week during winter. He also supports and superintends a Sabbath School, and the children undergo a weekly examination by him. The last occasion on which he donated food was the Christmas before his death when he gave 30 stones of beef and 636 pecks of coal. Others of means also did the same. 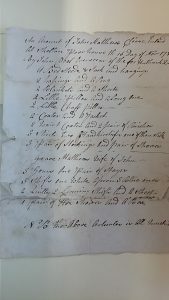 The Earl of Lonsdale gave beef, blankets and clothing to those in the Lowther Castle area, and Joseph Cowper of Unthank gave soup to the poor at Christmas. Jolliffe’s visits to the poorhouse with supplies of tea, sugar and soup are reported as regular occurrences too. Jolliffe contributed to the subscription for relief of the Waterloo sufferers following the Napoleonic Wars. Jolliffe concerned himself with the education of the children at Skelton school. 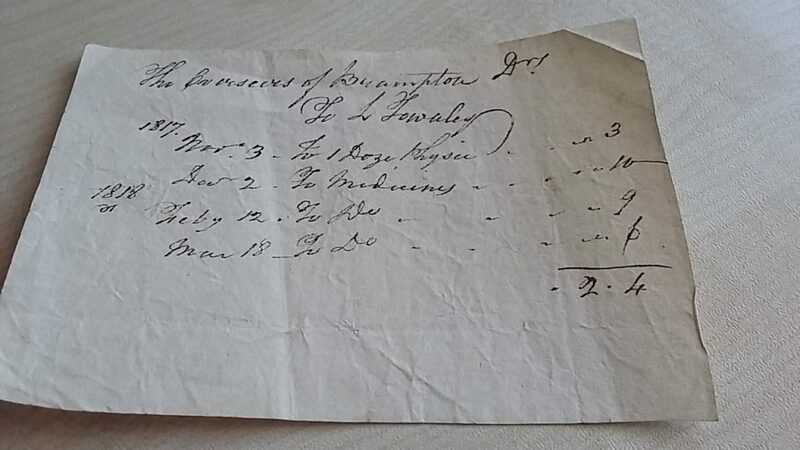 The disbursements record that in 1819 and for the next 18 years until he resigned his post and moved to Workington, Robert Loraine, schoolmaster of the parochial school, was paid £16.3s.5d every half year. The trustees of the school were led by Rev’d Jolliffe. 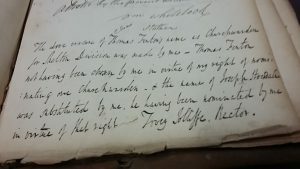 In 1798–9 Overseers of the Poor and Churchwarden account books report Jolliffe striking out one churchwardens and replacing him with one of his choice. The Rectory provided Jolliffe with an income, some coming from tithes and rents. In 1823 Leeds Intelligencer Jolliffe’s name is on a list of gentleman who had reduced tithes in order to help those struggling with high wheat and grain prices as well as stagnant wages. In publishing the list it was hoped that pressure would be exerted on others to do the same. From early on, Jolliffe had purchased small pieces of land around Skelton and continued to do so for the remainder of his life. As open ground started to be replaced by enclosed land, opportunities arose for the creation of a market in land purchase. In 1796 Jolliffe’s mother’s cousin (Betty Smith) died leaving Jolliffe half of Hale Manor and the tenement of Stile House in Arreton, Isle of Wight, near where he was born. 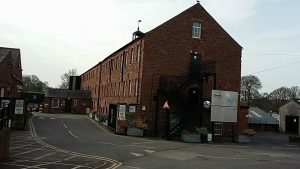 By his death in 1830 he had at least 27 properties including fenced of areas of land, allotments, orchards and property to his name in Skelton. He also had property mortgaged to him between 1798–1814. One property he purchased in 1820 was occupied by Jane Sewell (b.1759). 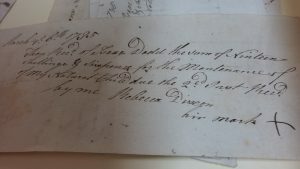 Sewell’s name appears on overseers’ vouchers between 1784 and 1788 for the maintenance of her child. 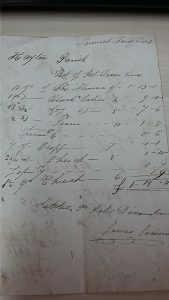 Payments of £0.19.0 and £0.16.0 were made by Isaac Dodd, clerk. The parish register records the birth of this child, Mary, as base born in 1779 and a further illegitimate child, Ann, being born to Sewell in 1789. Jane had lived in Skelton since 1781. What happened to her after Jolliffe purchased the property is unknown. Jolliffe collected rents for the properties he owned. 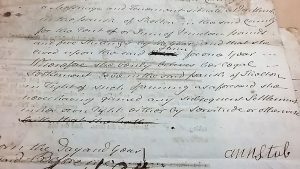 Tenant Joseph Robley who had a 21-year lease paid £36 a year; William Whitelock and Joseph Thompson paid £82 a year each. 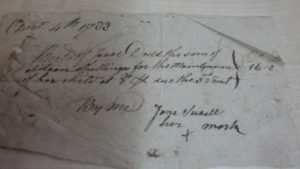 A churchwardens voucher of 1802 shows a payment made by William Whitelock:Rec,d of William Whitelock by the hands of Rev’d Jolliffe the sum of one pound, one shillings and sixpence due to the estate of the late Jos Sanderson. 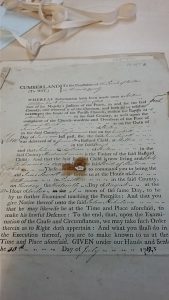 Jolliffe had also purchased land in Carlisle. 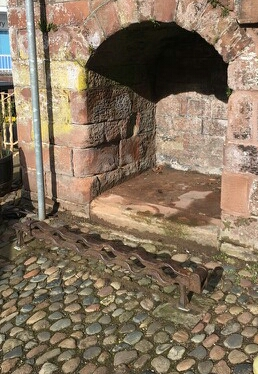 Evidence for this is found in 1830 when a meeting of benefactors and subscribers for the building of an Infirmary in Carlisle agreed to purchase land at Coldcoates from Jolliffe. 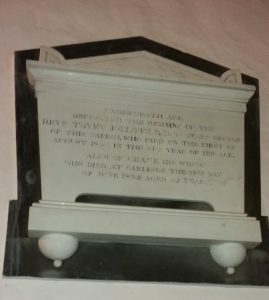 Underneath are deposited the remains of Rev’d Tovey Jolliffe B.D 39 years Rector of this Parish who die on the first of August 1830 in the 81st year of his age. Also of Grace his widow who died at Carlisle the 19th day of June 1832 aged 82 years. Grace died at her home in Castle Street, Carlisle. Tovey and Grace had no children. The Jolliffes appear to have amassed an estate of considerable value. Jolliffe left a new cottage and garden to Corpus Christi College, Oxford. Joseph Cowper had the two thirds of Jolliffe’s estate he purchased from the Jolliffe family valued in 1839. It records the purchase price as £2200. Jolliffe is also listed as a donor to King’s College, London. His contribution was £50. William Whitelock died 8 May 1817 aged 78 years. 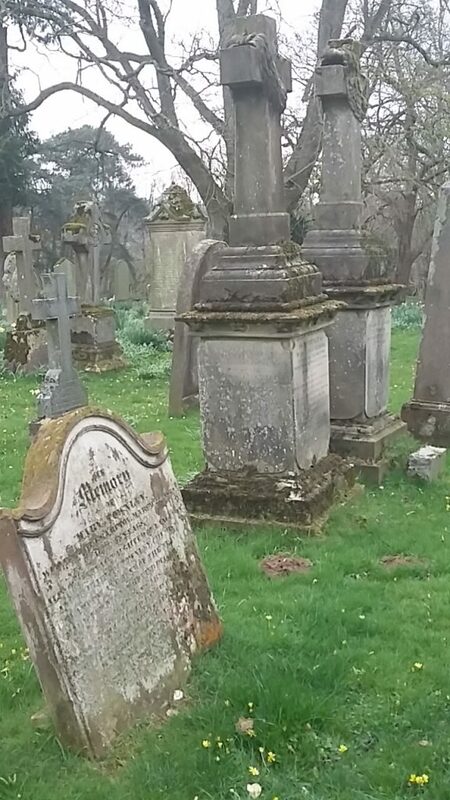 He is buried in Skelton Churchyard along with his wife, Rebecca, who died 28 November 1820, aged 80 years. This is a work in progress, subject to change with additional research.